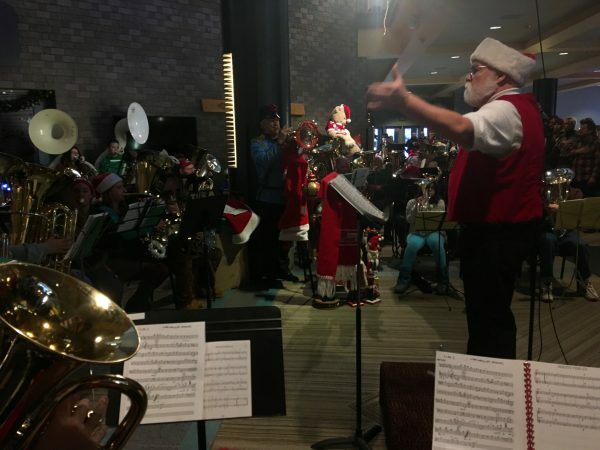 On a snowy Saturday morning in mid December, Alaskans of all ages packed the lobby at the Alaska Center for the Performing Arts to celebrate a beloved holiday tradition — TubaChristmas. It unfolds like this: Two hours before show time, musicians begin making their way to the downtown performing arts center, hauling music stands and instrument cases and stomping snow from their boots at the door. They register, collect their sheet music and head for the elevator, which carries them to the warm-up area set up on the top floor balcony. Outside the closed doors of the Evangeline Atwood Concert Hall, the musicians meet for the first and only rehearsal before the show. The ensemble includes elementary school music students, retired professionals and hobbyists. Craig Blake was a middle school student in New York when he performed in the inaugural TubaChristmas at Rockefeller Plaza. Forty-five years later, he’s still playing. In the upstairs lobby, Director Neal Haglund leads the musicians through the opening lines of “The Little Drummer Boy,” the Alaska Flag Song and other Anchorage TubaChristmas classics. As the musicians run through their parts, the sonorous sounds of dozens of tubas, baritones, sousaphones and other brass instruments well up to the rafters. As the musicians settle into their seats by the box office, spectators file into the crowded lobby, bundled up in flannel and fleece and Carhartt. They fill the chairs arrayed across the floor; they squeeze up the staircase; they crowd against the balcony railings on the second and third floors. They sing along to “Silent Night,” and shout “Wassail!” in unison — a spirited salute to Mr. Whitekeys’ classic show, Christmas in Spenard. Toddlers watch from parents’ shoulders; other spectators bring their own folding camp chairs. Lisa Mallery came to watch her husband perform, just like she has for years, she said.